Cobra One Length irons are the first single length clubs manufactured by a tier 1 golf supplier. Cobra has invested in this technology and concept through both this set, the forged one length iron set, and their sponsorship of Bryson DeChambeau. These irons look and feel like a well-put-together set of golf irons — the top-line, back, and bottom of the irons have all been thoughtfully designed, from the contrasting silver/black on the back to the matte silver highlight on the sole. The sweet spots seem quite large as the carry distances showed little variance on slightly off-center hits. The price of this set is near the middle of the market, and the value of what you get vs. the price is quite high. I would recommend this set to golfers who have already tried single length irons and who are completely bought into the concept. If you have not tried single length irons before, the price may be a bit high for an experiment, although the re-selling market for these clubs is quite strong if you decide after trying them for several rounds that single length clubs are not for you. These clubs are designed for mid- to high-handicap golfers who have difficulty with clean contact throughout their current set of “standard” irons. The single length shafts eliminate the need to use multiple ball positions and swing planes, increasing the likelihood of center-face, ball-first strikes. The top-down view of the irons is classic and clean, which a narrow top line. The 109 gram steel shafts seem just right for club balance producing a D1 swing weight. I’m assuming that the change in design through the set is the result of Cobra’s “Tecflo” initiative. Tecflo is successfully used in this set to move the CG up/down according to whether Cobra wanted to launch the ball higher or lower in different irons. 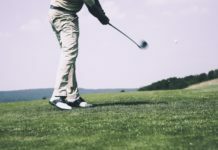 From a play-ability standpoint, you don’t really notice much difference in the work-ability or launch angle of the ball from club to club, which is as it should be — technology in clubs should be both transparent and beneficial to maximize the golfer’s perceived value without causing distraction. Cobra King One Length Irons retail at $699, although you can find them cheaper on Amazon and eBay. While this is not the cheapest set of single length irons you can find, they’re certainly not the most expensive either — the top-end of the market is around $1,200 per set. Given the quality of these clubs, I would say that the price is a good value for what you get. 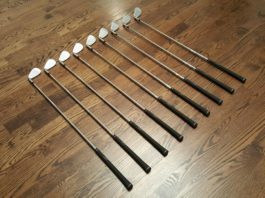 Having said that, you should be completely bought into the concept of single length clubs before spending this much on an iron set — there are much cheaper single length irons alternatives if you just want to get your feet wet without spending much. The gaps in the set are fairly consistent between 13 and 15 yards from club to club. On the day that I recorded the data below, I hit the 7-iron better than average, which threw off the gaps between it and the 6-iron and 8-iron. Since the gap between the 6 and 8 is 27 yards of carry, I would say that the 7-iron would typically carry about 172 yards for me. The complete irons weigh 432 grams, with a head weight of 273 grams. The lie of 62.5 degrees remains constant through the set since all shafts are 37.25″ long. 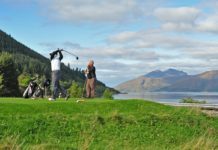 The offset ranges from 0.7 for the sand wedge to 5.5 for the 4-iron. As you can see in the tables below, the Cobra King One Length lofts are stronger than a typical set of irons from club to club, which is necessary given the single length shafts — longer shafts hit balls farther, so with a shorter shaft, a stronger loft is necessary to hit the ball the same distance.